Back to our normal programme - I now present another Jumper (or Sweater) from the Archives. 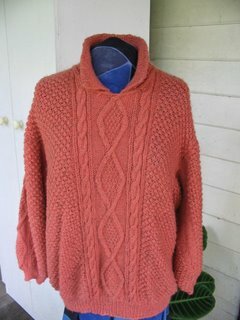 This Patons "Aran Style Sweater", circa 1988 is from the Patons Handknits book 926. The yarn, Patons "County" (discontinued) was bought from Greta's Handcraft Centre. I recall I was laid up in bed at the time so Chris went all the way to the North Shore and picked up the yarn for me. I must have been very, very keen to do all those hundreds of bobbles. Unfortunately it didn't travel overseas or go anywhere exciting in its life. I like your from the archives post, that is a great jumper. Will we be seeing more from your archives? Might not have gone anywhere but I bet it is lovely and warm.